The Dead Marshes, Pt. 3 ~ EE scene: “Master knows”…. In the third "Dead Marshes" post, screencaps, screenplay, and related book excerpts are presented for the EE scene in which Gollum complains of his hunger and Frodo tosses him lembas. An essay precedes the screencaps. 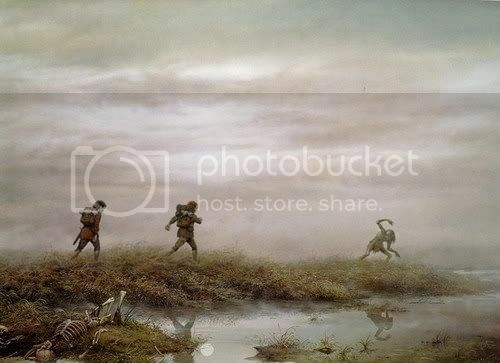 Tolkien’s depiction of the Dead Marshes. I love Tolkien’s descriptive writing at all times, but it’s exceptional in the Dead Marshes. In the short passage below, he chooses words that say a lot with great economy. Notions of rankness and decay abound, along with a sense of pale, insubstantial, thinness, combining the sense of death and rot with ghostliness. I thought the art designers and set people did a great job conveying a sense of the book setting, helped by the digital grading that bled most of the colour out of the landscape. Unfortunately it bled all the colour out of the hobbits, too (who are the only really living things in the Dead Marshes), but that was probably unavoidable. Even the lighting turned out well. I remember hearing in one of the production Extras that on the day they shot the outdoor views of the Marshes it had been really sunny. They had to bring the sunlight down in postproduction. But the final effect of bleary sunshine, barely eking its way through the mists, wan and pale, makes the film Marshes that much more unwholesome and eerie. Even the sun is obscured and oppressed there, as if the sun itself could be drained of life. Book scene: The description of the land, from The Passage of the Marshes. As the day wore on the light increased a little, and the mists lifted, growing thinner and more transparent. Far above the rot and vapours of the world the Sun was riding high and golden now in a serene country with floors of dazzling foam, but only a passing ghost of her could they see below, bleared, pale, giving no colour and no warmth….. There was a deep silence, only scraped on its surfaces by the faint quiver of empty seed plumes, and broken grass-blades trembling in small air-movements they could not feel. ‘Not a bird!’ said Sam mournfully. ‘No, no birds,’ said Gollum. ‘Nice birds!’ He licked his teeth. ‘No birds here. There are snakeses, wormses, things in the pools. Lots of things, lots of nasty things. No birds,’ he ended sadly. Sam looked at him with distaste. Although Ted Naismith did not work on the films, I thought Peter Jackson must have liked the look of his vision for the Dead Marshes. The film scenes of the three wending their way through the bogs very much recall the look of Naismith's illustration. Book scene: The giving of lembas to Gollum, from The Passage of the Marshes. At the word hungry a greenish light was kindled in Gollum’s pale eyes, and they seemed to protrude further than ever from his thin sickly face. For a moment he relapsed into his old Gollum-manner. ‘We are famisshed, yes famisshed we are, precious,’ he said. ‘What is it they eats? Have they nice fisshes?’ His tongue lolled out between his sharp yellow teeth, licking his colourless lips. Frodo broke off a portion of a wafer and handed it to him on its leaf-wrapping. Gollum sniffed at the leaf and his face changed: a spasm of disgust came over it, and a hint of his old malice. ‘Sméagol smells it! ‘he said. ‘Leaves out of the elf-country, gah! They stinks. He climbed in those trees, and he couldn’t wash the smell off his hands, my nice hands.’ Dropping the leaf, he took a corner of the lembas and nibbled it. He spat, and a fit of coughing shook him. The hobbits munched their lembas in silence. Sam thought that it tasted far better, somehow, than it had for a good while: Gollum’s behaviour had made him attend to its flavour again. But he did not feel comfortable. Gollum watched every morsel from hand to mouth, like an expectant dog by a diner’s chair. Only when they had finished and were preparing to rest, was he apparently convinced that they had no hidden dainties that he could share in. Then he went and sat by himself a few paces away and whimpered a little. Below is the screenplay for the EE scene in which Frodo offers Gollum food. Although I have posted it out of film sequence, the EE scene is actually placed early in the Dead Marshes, before Frodo takes his plunge in the corpse-haunted water or secretly courts the Ring. Sam, Frodo, and Gollum pause to rest in the dry grass. Sam scowls at the place, and at Gollum, who sits moping a few yards off, moaning pitifully about the state of his hunger. Apparently deep in his own thoughts, Frodo munches the piece of waybread Sam has handed him, not paying much attention to either of them. Sam: I hate this place. It's too quiet. There hasn't been sight nor sound of a bird for two days. Gollum: No, no birdses to eat. No crunchable birdses. We are famished! Yes! Famished, we are, precious! Frodo glances Gollum’s way when he says that he is famished, and watches with mild interest as Gollum seizes and swallows a large worm. Sam stops eating and gives a disgusted look. Frodo breaks off a piece of his lembas. Frodo tosses the piece in Gollum’s direction. It falls several feet short, landing in the grass. Gollum scuttles over to find it. Taking it up eagerly, he turns it over in his hands examining it. Gollum: What does it eats? Is it tasty? Gollum bites into it but starts choking, spitting it into the grass. Sam casts him a dark look, but Frodo goes back to his private thoughts. Gollum: It tries to chokes us! We can't eats Hobbit food! We must starve! Sam: (Casting a hard glance at Gollum) Well, starve then. And good riddance. Gollum takes up his plaint in more tragic tones, moving a bit closer, addressing Sam. Gollum: Oh, cruel Hobbit. It does not care if we be hungry. Does not care if we should die. Gollum turns his attention Frodo, creeping closer. Frodo notices and casts him a reluctant, sidelong glance. Gollum: Not like Master. Master cares. Master knows. Yes. Precious. At the word “Precious,” Gollum’s eyes have fastened to the place where the Ring lies under Frodo’s shirt, Frodo’s hand tentatively reaching for it, clutching it through his shirt protectively. Gollum continues to stare at Frodo’s shirt front, clutching his own hand, mirror-like, over his bony chest. Gollum:….Once it takes hold of us, it never lets go. As if mesmerized, Gollum’s hand lifts, his fingers stretching softly towards Frodo’s breast where he still clutches the shirt-covered Ring. Frodo bats Gollum’s hand away. Gollum, looking surprised and stricken, falls back. Frodo, his breaths coming quickly, gives Gollum a furtive glance as he crawls away to lie dejected in the grass. Sam returns to his broody munching and Frodo again stares into the middle distance. There are many things I don’t like about this film scene, but I appreciate that it picks up some of the mood, the hobbits eating in silence, Gollum's hunger, Gollum going off to whimper afterwards. Best is the way it develops the problematic relationship between Frodo and Gollum. Coming in the film as it does before Gollum saves Frodo and the scene in the night, in which Frodo presses Gollum to remember his old identity, it's the first strong statement of the dark, Ring-based psychological kinship between the film characters. Yet the scene always comes across to me as essentially odd, not quite fitting with the rest of the film. In screencapping this sequence—which necessarily requires stopping and assessing to an unnatural degree—I came to the conclusion that some of the oddness of the way it plays comes from insufficient advance planning on the part of the screenwriter-filmmakers. The finished scene turns out to be a showcase of Gollum's acting ability, as if he had come downstage in an opera house to sing his big aria. He almost literally takes the stage, filling the foreground as he strikes histrionic poses, lifting his voice to the heavens as he states his case. The hobbits are almost entirely shown in the background as Gollum emotes. Subsequently, they seem markedly disconnected from what Gollum is saying and doing. Not only are they more distant visually, they simply don't appear to be in the same scene. Sam has a few stock scowling looks, but it's basically sit-and-munch. Frodo, apart from a couple of very brief, affect-less glances in Gollum's direction, does not look at him at all. He sits like a lump on his tussock, munching and thinking in his own unspecified mental world like a broody hen on its nest, or someone sitting bored and dissatisfied on a toilet. Perhaps he needed a magazine? When Gollum is flailing about, making moan about how cruel the hobbits are and how hungry he is, Frodo pays no attention, continuing to munch absently on his wafer. His body language remains unchanged, too, parked on his toilet-tussock, literally unmoved. The exceptions are the close-ups: reaction shots that follow specific moments in Gollum's monologue. As for the rest of the scene, all the non-reacting going on in the longer shots could be meant to show that Frodo was dispirited or broody or deep in thought. But I suspect that when they shot the footage of Frodo and Sam sitting in the grass munching their waybread, they just didn’t know precisely what they were going to have Gollum do or say. “Right, lads! In this scene Gollum is going to go on about how hungry he is, erm, basically over here… The script girl will read the lines we’ve got so far. Just give it your best shot and we'll add whatever we need later.” I'm guessing that's the sort of direction the actors received. * They used tennis balls in countless blue screen scenes to show where actors were to look, in order to relate to characters speaking and moving around who were not really there, but the tennis ball seemed more vaguely placed in this one. In the finished film, Gollum moves around a good deal as he emotes and flails, but the hobbits don’t seem really to see or hear him, even when they are looking his way. I think the close-up reaction shots were all edited in later, after they had completed Gollum's part of the scene. But when I'm watching the film, the sense remains that the hobbits are inexplicably unaffected by what is a very pitiful picture of Gollum in the scene, almost as if he didn't exist. And, in a way, I suppose he didn't. Only in the scene’s closing—which is truly excellent, when Gollum draws near saying, “Master cares, Master knows”—does Frodo seem fully brought into the scene. Sam has had his disgusted close-up after he watches Gollum swallow the worm, but Frodo hasn't really connected with what's going on in a convincing way. The "Master knows" scene is shot in a series of excellent alternating close-ups of Frodo and Gollum. It certainly seems as though Frodo is playing off specific lines and gestures, perhaps (by then) provided by Andy Serkis himself. And the scene works. It does much to establish in a fascinating way the dark, Ring-based psychological kinship that is part of all of Frodo and Gollum’s future scenes. The connection between them is made in the viewers' minds, which by itself justifies the scene’s inclusion. It’s a shame this intense, taut encounter ends with Frodo’s weak (dramatically speaking) batting-away gesture as he tells Gollum not to touch him. It is only conjecture, but I am guessing that the batting-away gesture was the result of the film-makers not knowing precisely where Gollum’s body was going to be when the scene was completed. Frodo bats Gollum’s hand away (rather than seizing his wrist or something other gesture that would be more defined and strong) so that the CGI team would have more leeway showing when his hand made contact with Gollum's. That is perhaps why Frodo tossed the lembas into the grass, too: because it made it easier to show Gollum receiving it that way. It would be far more technically involved to show the giving of the waybread as described in the book, transferring it from one hand to the other. It would be much simpler to show the piece falling into an unseen location between the tussocks. Then Gollum could lift it from wherever it had landed, the piece only then reappearing in his CGI’d hand. Apart from the visual aspect, the tossing of the lembas spoiled a beautiful book moment for me. In the book scene, Frodo offers Gollum his waybread the way any well-bred person would offer another a share of his food. But film Frodo tosses the lembas to Gollum as if Gollum were a dog, as well as letting something Frodo believed precious and rare—the Elvish way-bread—land in “dead grasses and rotting reeds”. Frodo would never do this: either failing to hand food to someone else in a courteous manner, or tossing lembas on the ground. However loathsome Frodo found Gollum, and however stern Frodo could be to him, he was never discourteous or contemptuous to him. And whatever Frodo did or didn't think were the otherworldly properties of waybread, he would never have treated a gift of the Elves with such disregard. * ETA note: On 12-07-07, not_alone posted a fascinating entry in her series on the making of the films, Ch. 12, The Filming of the Dead Marshes. Scrolling down to the appropriate images, one can see from the production shots that Andy Serkis was present for the filming of this scene, acting the part of Gollum throughout. Thus, if the finished sequence makes it appear that Gollum wasn’t actually in the same scene as Frodo and Sam, it is the fault of those actors, not the lack of a real Gollum, or, perhaps, the direction they received. As usual, the screencaps of this scene have been cropped, as well as adjusted for brightness, contrast and focus. I'm sure my fellow Frodo fans will deeply appreciate the close-ups of Frodo, when he seems truly engaged in the scene, Gollum coming close and saying, "Master knows...."
The level of disengagement comes across as an "off" feeling, or a "blah" feeling when watching the scene, but it's very apparent how unengaged Frodo and Sam are when watched with attention. Too bad they didn't go back and re-do the Sam and Frodo footage, once the Gollum material was in place! With your usual excellent analysis, you have pinpointed what has always bothered me about the scene. Yes, the hobbits are far too static, even disconnected from each other, as they are not in the book. And you are so right - Frodo would never have treated Elven bread or Gollum discourteously. Thanks for your insights! You are welcome, Nota. I was talking to Jan who thought Frodo (in the book) handing Gollum the waybread--even Tolkien said the lembas had Eucharistic connotations--was like a Christ-figure offering a Judas figure consecrated bread. I can see the symbolism there, or at least the Eucharistic sense that Frodo sought to share even with his enemy the special food that kept him and Sam alive. Thank you for that penetrating analyze of the scene. I've always thought it didn't work very well, but I didn't know exactly why, although I know I was shocked by Frodo tossing the lembas into the grass. It's totally OOC! I can't imagine Frodo being so contemptuous of Gollum either. I love your comparison with the Sistine Ceiling; that would have made such a beautiful scene! Thanks, and I'm glad you thought a "Sistine Ceiling moment" would have worked there. I think it would have been worth the CGI--far more than the time and money it took to create an extra troll squirmish. I was shocked by Frodo tossing the lembas into the grass. It's totally OOC! I can't imagine Frodo being so contemptuous of Gollum either. Yes, the OOC-ness of this scene was difficult for many fans, I am betting, but especially Frodo fans, geared as they were to want to like whatever extra material was offered that featured him. As I said, I do think this scene has some very worthwhile moments (which will make me keep rewatching it, never fear! ), but overall it did not quite succeed. You made a lot of interesting observations here. I never liked this scene much either, but I never knew why exactly. Perhaps it was caused by the filmmakers not knowing what they would do with Gollum in the end. I always thought Frodo and Sam's reactions were odd myself, and this would explain a lot. Yeah, it was a strange scene. Not strange in the book, but in the film. I really think they didn't synch the hobbit footage with what they created for Gollum. It was probably too expensive to go back and re-do the Sam and Frodo material shot on the actual set. You are so right about the lembas. The scene was "off" to me too. Hi, Peachy! Yeah, it could have been better. Very much so. But I'm still glad it was in the EE. Well, obviously, or I wouldn't have bothered to cap it or write about it (D'OH!). Thank you, White Gull. It does feel pretty lonely sometimes, though, doesn't it? I feel positively retro still posting about LotR and Frodo like this. "When is she going to grow up?" Well, as I told some people high up the thread (or was it in the previous one?) I feel time pressing. Like I see the barn ahead, both because I'm going to be working a lot more hours and have so little free time anymore, and because I want to get this series done before there's no one left who would want to read them. Apart from the visual aspect, the tossing of the lembas spoiled a beautiful book moment for me. I agree! I have never liked that bit and always felt that it was one of the "best" examples of what I don't like about Movie!Frodo. He doesn't have the maturity, fine feeling or dignified, gentlemanly behaviour of book!Frodo. I really hope some day that there is another movie made of LotR that gets Frodo right. It is, perhaps, my fondest wish. As much as I love Jackson's movies, I don't feel as if LotR has been properly "done" yet. I love your essay and, as usual, gives me food for thought. I look forward to watching that scene again with your words in the back of my mind. Thanks for posting, Gentlehobbit. I don't think I'll be alive when anyone attempts to make LotR again as a film (films), but if they do, I hope they try going a whole other route. I don't see how they could out-spectacle or out-epic what PJ and co. made, for it remains the most awesome movie experience for me ever, no contestants even close to it. But I've been listening to the BBC radio version of the book, a version that like the films has both excellent and less excellent moments, but one of the things I love about it is how much character work there is in it. Because they just couldn't do the epic stuff on radio very well, they concentrated on the dialogue scenes. The material between Frodo and Bilbo and Frodo and Sam, not to mention a lot of other characters is so moving and beautifully played. I was just listening to the Lorien and Amon Hen scenes. The Boromir is not well-cast or directed, but otherwise these were all splendid. And if it wasn't for film Frodo's mind-bogglingly classically-beautiful looks, and his Elvish other-worldly quality, there would be no contest that I would love Ian Holm's Frodo so much better I would never watch the films again (well, the Frodo scenes). He doesn't have a bit of the Elvish quality, but he's warm and clever, melancholy and merry, very well-bred; vulnerable yet strong, and, well, supremely *human* -- and humane -- as Frodo. True, he was already Frodo's book age playing the radio role, not a teenager like EW, so I'd expect him to bring more maturity and experience to the role, as well as a couple of decades of important stage and film work. William Nighy's Sam is better than ANYTHING I ever imagined reading the books on my own, too. Thank you, Mechling, for another absorbing post. Tolkien’s description of the land, from The Passage of the Marshes, is so eerie and full of atmosphere you could cut it with a knife. Yes, he wrote great description, and that is a good example of what he would do. His images of the land and weather were like characters themselves, living and full of moods. I've been meaning to make a big pic spam with your screencaps so that more people will know about you and your wonderful archive. Shall do that one day (but need to make a few icons first before everyone snags the best ones !!! :D). You are so kind. Thank you for the compliment. I think my icons are rather plain compared to ones people have applied effects to. But I like to see the One Lad clearly. If you do such a post, you may want to point them to the Screencap table of links. I've made it very nice, with a scroll-through list of thumbnail links to indicate what's in each entry, all lined up in film order. The exceptions are entries like the one for Frodo waiting for Sam [not "Frodo", lol!] in Tol Eressea. I used caps from FotR although the part of the story being illustrated was at the end. I need to file those twice. In film order for the caps, but story order for the discussion and poem that went with them. But the table is very clear and handy otherwise. My only doubts about it is that it's such a big file, the table page, it takes a while to load. If you ever open it, Frodosweetstuff, see what you would think about eventually making multiple pages of screencap links with one master page. The master page would give links to the separate pages--one for FotR, one for TTT, one for RotK, one for Extras and odd images, one for Elijah in other roles. That way the link pages should come up much more quickly. But maybe it's not really necessary. I just clicked on the link and you are right - it takes a while to load, even with DSL and a speedy browser. I think your idea of the master page with links is good. So you find it takes a while to load, too? It must be that the links take up space. The images are all very small so it can't just be them. When I finish the screencap project (a few more month's work?) I'll break them up into a system of smaller pages with a master page, as I described. That should help a lot. When I open the table of links for the manips or Jan's poems, they come up quickly, but they have a tenth of the entries. Yes, the screencaps were begun in 2005. I was very timid about tweaking them then, so the contrast and focus is not as sharp as I now like to make them. The oldest caps are from the opening of FotR. Later I skipped around, doing Behind the Scenes caps and some from the end of RotK. By the time I made the caps for the RotK end scenes I was a much bolder tweaker! It seemed to me it was the pics - I could see the writing but the pics took ages to appear - and I have DSL 6000 and have switched to a quicker browser. This scene bothers me all the time I’m watching it. Frodo and Sam barely aware of Gollum. Even Frodo and Gollum aren’t that close friends, Frodo don’t hate him – he’d never treated him like a dog. That’s it – like a dog, That’s what I was thinking watching the scene the first time. Never ever he would have treated an Elven gift so careless. It seems – to me – Frodo isn’t there, Sam, too. Sam even more. The don’t look at Gollum, they don’t look at another, they don’t look at anything. There are just in place (I hope you know what I mean). In the books this scene is so important and wonderfully written – in the movie this scene doesn’t work for me. The screencaps are wonderful as always and so are your words, lovey. You're right, this scene does not work, even within the context of the film relationships. The treatment of Gollum (ignoring him) and the lembas, tossing it into the dank grass of the Dead Marshes instead of handing it to its recipient, is disturbing and most unsatisfactory. Yet I do think the moment of contact between Frodo and Gollum is awfully good. So I always watch it when I watch the film, even if I think the majority of it is poorly done (in that they did not have the hobbits related to Gollum's actual presence: his lines, his movements and emotions).